French President Nicolas Sarkozy has sacked his diversity adviser after he called on Muslims not to support the governing UMP party, reports say. Abderrahmane Dahmane, a Muslim and former UMP official appointed to his post only in January, was protesting against a planned debate on Islam. He said Muslim members of the UMP should not renew their party membership unless the debate was cancelled. He condemned UMP leader Jean-Francois Cope as a "plague for Muslims". Mr Dahmane's sacking was reported by the French news agency AFP, which gave no details. The UMP (Union for a Popular Movement) is planning to hold a public debate on 5 April on "Islam and secularism". The debate will explore firstly how "the practice of religions may be compatible with the rules of the secular republic", and secondly "the question of Islam in France". Speaking on Thursday, Mr Dahmane compared the situation of French Muslims to that of Jews during World War II and said the debate had been planned by a "handful of neo-Nazis". France has the largest Muslim minority of any EU country and controversies have arisen over the state's attempts to impose secular values in public institutions such as schools. 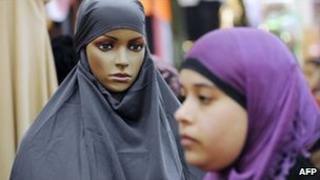 A public ban on face-covering veils comes into force on 11 April.